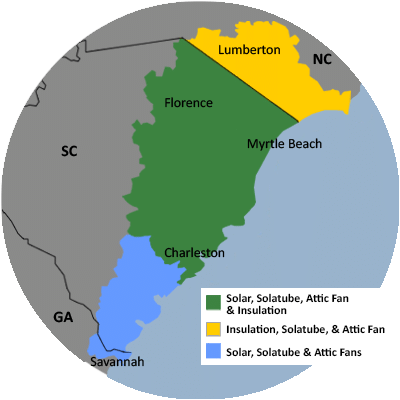 For a FREE no-obligation estimate in Sumter, SC, please fill out the form to the right and Carolina Energy Conservation will contact you shortly. I pay 300+ dollars per month on electricity during the hottest and coldest months of the year. We would like to have ideas on what needs to be fixed for insulation in the house, and if the price is right, get it fixed. Interested in the average cost to have a Solar Star Roof Mount 1600 installed. I have concerns of the ductwork in the crawl space under the house. I want to get it evaluated. Also, I don't believe the attic insulation is sufficient and want for it to be reviewed. Looking at getting my attic insulated. The home was build in 82 and has a few spots with no insulation, varying types and depths of insulation, and numerous random wires (alarm system, etc.). I'm at least looking to get the wires tamed/identified and fixtures and vents blocked off so I can install a radiant barrier and blown in insulation (or if you guys are reasonable enough, have you do all of it). Pest control people tell us there is now moisture under the house which has always been dry before. We have a mobile hime and want the under portin of the home sprayed foamed. Looking for quotes to spray insulate an attic in the Sumter sc area. Sumter, SC according to the 2010 census has a population of 40,524. Sumter is home to multiple schools of higher education including Morris College, Troy University, Webster University and the University of South Carolina Sumter. Not far from Sumter is Carolina Energy Conservation. At Carolina Energy Conservation, we are here to make your home more energy efficient and save you money through our installation of energy saving products. One of our most efficient products is the ECO-Guard PLUS, this system has been proven to reduce your home’s energy consumption year round and can be installed over already existing insulation. Other services we offer are blown-in insulation, LED lighting installation, hybrid water heater installation among others. At Carolina Energy Conservation, we understand that energy costs can be very frustrating throughout the year, whether it’s during the hottest part of the summer or the coldest part of the winter, your HVAC system has to work very hard to keep your home comfortable. We look to take those high costs off your shoulders by installing a range of energy saving products according to your home’s specific needs. We only use the highest quality products and won’t leave a customer until they are 100% satisfied with the work we have done. Call for a FREE Quote in Sumter today, please fill out the form to the right and Carolina Energy Conservation will get back to you shortly. Get a FREE Home Energy & Insulation Quote! Would like estimate to insulate crawl space using expanding foam or rigid foam. House is rectangular, 26 X 48 feet, 3-foot dry plastic-lined crawl space. Please send estimate by email.